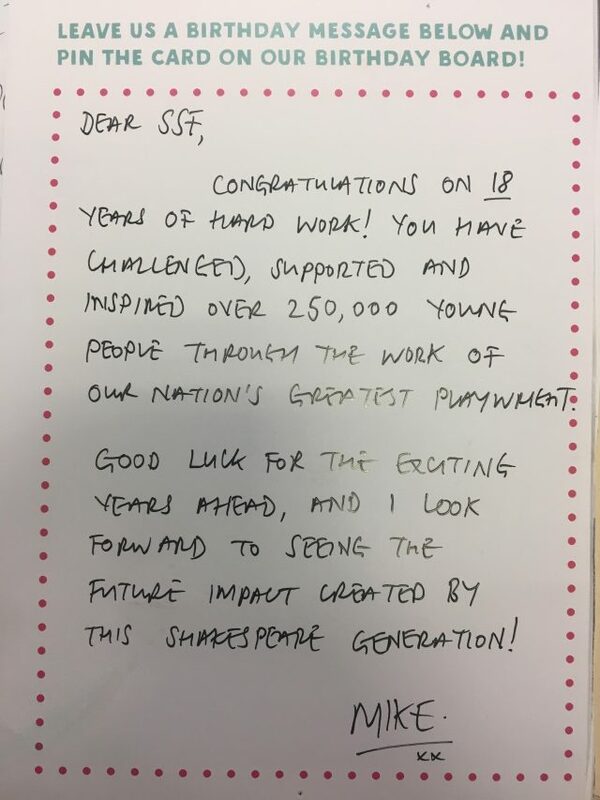 On Monday 24 September friends, supporters and partners joined SSF in an evening to celebrate eighteen years transforming lives through Shakespeare. The 18th Festival Launch marks a key moment in SSF’s calendar. It celebrates the exhilarating journey over 800 schools are currently under taking in this year’s Festival. It gives us the opportunity to thank the generous supporters who have changed thousands of young people’s lives from all over the UK. It provides a time to look forward, to join forces and continue our pledge together: to give every child, no matter their background or ability, the confidence to succeed in life. During the evening, two schools showcased their work as they currently rehearse for their 2018 Festival performance. A young Caliban, from Arnhem Wharf Primary School, opened the evening brilliantly with the speech “This Isle is Full of Noises” from The Tempest. Ark Academy then took to the stage with patron John Heffernan to do an 11 minute Much Ado About Nothing – we have never seen a cast so full of energy and enthusiasm! The performances were followed by a heartfelt and honest speech from supporter Peter Kessler. 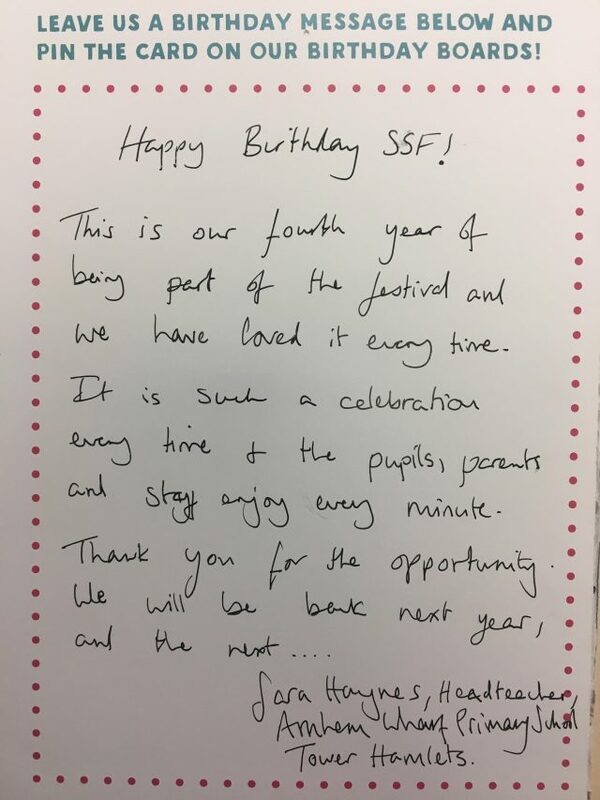 He told us of his experience directing a cast of boys in their version of Macbeth four years ago and why he now donates, supporting a school every year. 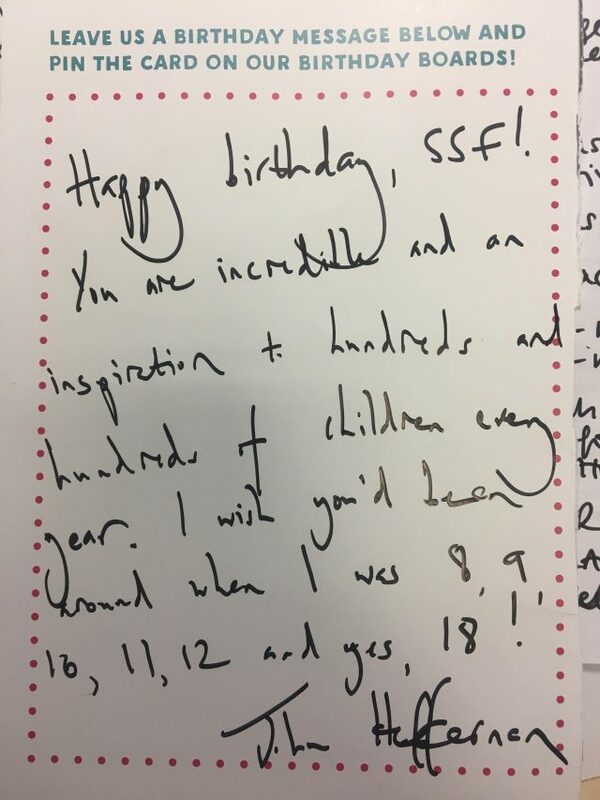 During the evening, guests were encouraged to write 18th birthday messages to SSF and we have collated some of our favourites below. 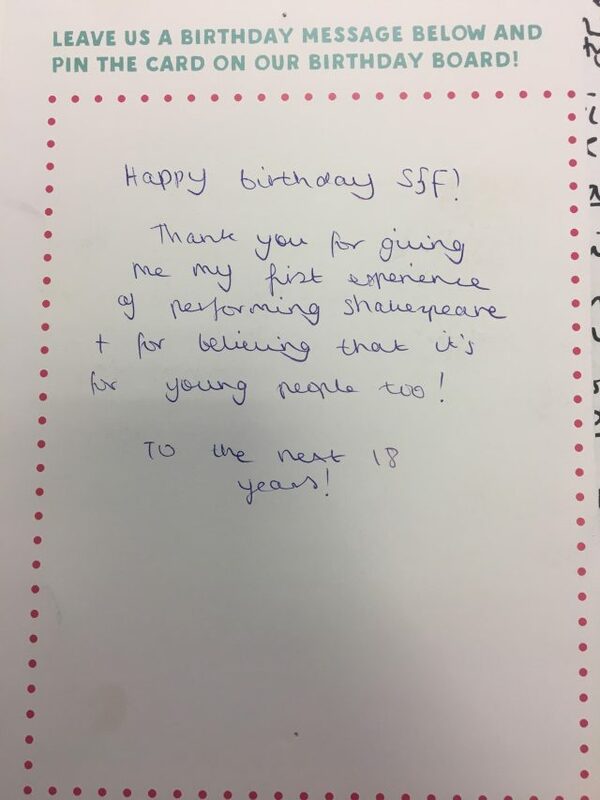 If you have a birthday message for us please do send us a tweet including our brand new Festival hashtag: #BreakthroughShakespeare - we love hearing from you! CEO Ruth Brock closed the evening with a speech that recognised the crucial need for the charity’s work and a heartfelt thanks to supporters who make it happen. Her full speech can be seen below. On our eighteenth birthday, it would be easy to stand here and only speak of the many fantastic things SSF has done since the first teenagers stepped onto the stage in Milford Haven in the year 2000. It’s true that 300,000 children have had the chance to gain the confidence they need to succeed in life. We’ve worked with hundreds of theatres who have new audiences because parents came to their local theatre for the first time to see their child perform. Thousands of teachers have become better practitioners. Tens of staff members have given wonderful service and gained skills that are helping them to fly in their careers. Dedicated Trustees, not least our redoubtable outgoing Chair, Andrew Jackson, have guided us and given generously, not least of their time. I’m proud that in this anniversary year, we’ve won three awards recognising different aspects of our work. The Management Centre’s “Donor Love” award, for the stewardship of our valued supporters. The Education Awards “Resource Provider of the Year” for our curriculum packs and, in July, we were deeply honoured to be announced as the recipients of the Japan Art Association’s Praemium Imperiale Grant for Young Artists - an international award for organisations nurturing young artistic talent. Hundreds of generous and committed supporters have made that journey possible. I’m so delighted to see many of you here this evening, I wish I could name you all - but from the backing of the Social Business Trust, the sponsorship of BML and PQA, the commitment of Trusts such as Leatherseller’s - many many generous individuals and people who have given their time and energy - Rob & Dec who masterminded our recent Comedy Store event, John Kelsey Fry and Sally Bennett Jenkins who worked so hard for us on trial of Richard III, to our newest Patron, Athena Stevens - this amazing cast, this ensemble have enabled life changing experiences. But the truth is, it’s not about us as a charity. The progress we’ve made is set against a backdrop that makes the landscapes we’re operating in more difficult than ever before. It’s not about us, the organisation, it’s about the young people who need our work more than ever. In his speech, Peter referred to his initial impression that this was a charity whose need maybe wasn’t as imperative as others you might support. I can understand that. Research shows us children are more unhappy than ever. They don’t have the skills they need for the world of work. We aren’t giving them the creativity and imagination our future industries will need. They’re not getting the arts education that is proven to make them more likely to go to university, more likely to get a - and stay in - better job. The work you help us to do is vital because it creates empathetic, collaborative, tolerant young citizens - and in these times I think that’s vital, if we’ve any interest in the society we want to be. "My teacher used to say I have a little voice – now I don’t." To be able to ask for your ball back, to ask someone if they’re okay, or say something’s not okay, ask someone out or stand up for your rights, protest the building of a road, or a wall, the ability and courage to join in, stand out and be counted is intrinsic for life. Whether you’re head of a production line, leading a market research group, giving a patient their treatment plan or presenting to a Board, – clarity, confidence and collaboration are key. The Festival teaches this. It’s much more than a transitory arts experience. During that eight month process, children from every nation and region of the UK work with their peers from very different backgrounds - state, independent and special schools, primary and secondary, academy, comprehensive, college, all come together on one stage, united. The confidence, the self-belief engendered can last a lifetime. Children take the next step on their journey because they become confident and curious. They face their fears. Because it’s difficult, the impact is similarly robust. Children have an innate grasp of creativity and sense of story. They intuitively understand these big themes – friendship, love, conspiracy, justice and injustice, family breakdown, the rise of despots – because they’re living with them. The Festival in Belfast brought together Protestant and Catholic students on the same performance night. At the start of the process, parents from both communities were skeptical and some didn’t want their children going to the other school to prepare. But through rehearsing in a community hall, the children integrated and worked together in a way they’d not experienced before. And on the performance night parents from both communities sat next to each other. And perhaps that’s something we need more than ever before. My team are all here waiting to tell you more about what your support can do. We have nearly 300 performance nights across the UK this autumn – from Grimsby to Gravesend. They are all full of fantastic stories from the front line and they’re all deeply committed to our mission. You can support a whole performance night, an individual school, a child. You can become one of our monthly donors. We’re also launching our SSF Volunteer Community, a group of people who care about our mission and can offer their time to help us raise the funds we need to give children a chance. And through our Isle of Noises and Breakthrough Shakespeare campaign - you can legitimately spend time on your phones, spreading the word to bring attention and support to our cause. Turning 18 is an important, exciting and daunting moment of transformation for us all. The geeky 18 year old me with the Doc Martens and the bad hair would have no concept that she could stand here and make a speech to such a truly awesome assembly of supporters. But just as turning 18 means big decisions and big steps to take, so SSF is always looking ahead. The Festival is all about lasting transformations. Whether it’s making new friends, realising that something difficult and intimidating can be conquered and enjoyed, or developing a new sense of pride - the Festival changes young lives. Please join us in working to make that realisation a reality for many many more children.